SkinMedica is the fastest growing skin care company in the Physician-dispensed channel. We recommend SkinMedica products because they contain clinically proven ingredients that are naturally found in skin and are especially chosen and formulated to provide all of the elements necessary for enhancing the natural process of skin rejuvenation. 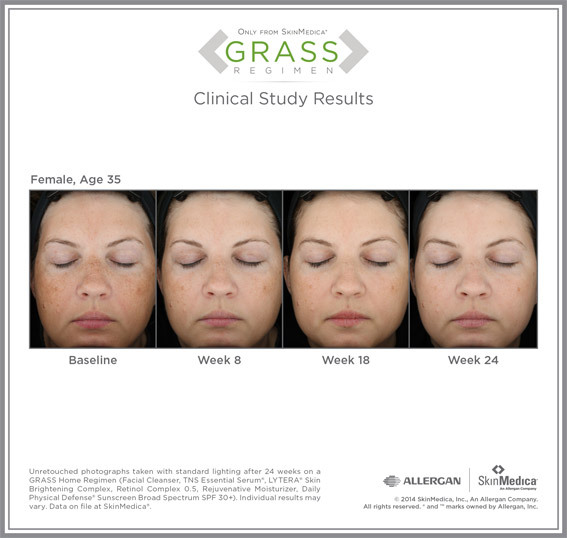 SkinMedica's innovative approach to skin care implements the GRASS method, benefiting patients by putting their skin back into balance. Growth factors: Proteins present in the skin in a physiologically balanced combination to support the foundation of the skin. Through normal aging, the production and level of growth factors decreases. The SkinMedica growth factor products are clinically proven to improve the appearance of fine lines and wrinkles, skin tone, texture and resiliency. Ask us about TNS Essential Serum or TNS Recovery Complex-- Dr. Arthur's favorite product! Retinols: Improve the appearance of skin imperfections caused by exposure to the sun, environmental factors and aging through enhanced exfoliation, which leads to smoother skin and a more even skin tone. Antioxidants: Improve appearance of skin tone, texture and firmness while helping to prevent free radical damage. SkinMedica's unique formulation use stabalized forms of vitamins C and E and utilizes two types of antioxidants: water-based and lipid-based. Vitamin C + E Complex and Dermal Repair Cream both offer very high concentrations of vitamins C and E.
Specialty Products: Products targeting specific skin imperfections such as discoloration and dark spots. Lytera Skin Brightening Complex is suitable for all skin types (non-hydroquinone) and effectively reduces the appearance of dark spots, creating a more even skin tone. Sun Protection: Defends the skin from harmful UVA and UVB rays and helps to protect against premature aging due to photodamage. Total Defense + Repair SPF50 Superscreen defends the skin from UVA, UVB and Infrared rays while coreecting the signs of aging and supporting the skin's ability to restore itself. Call our office for a complimentary aesthetic consultation to learn more about SkinMedica products.